Ask fellow campers about "Big River Regional Park, Community Center Campground" and nearby attractions. The rate shown is for a full hookup site and the regional park access fee. There are two campgrounds at this park - Cowan Lake and Community Center. We stayed at the Community Center Campground on 1st Ave. It has full hookups while the other campground had only electric. The campground host site is next to the office. If he is not in the office, you can call his cell number or see if he is at his site. It is best to check with the host to see what sites are available. I went ahead and found an empty site and was lucky no one else had reserved it. Our site was a grass back-in that was fairly level, but a lot of the surrounding sites were not. Also some of the sites are confusing in their layout since their space is all grass and the hookups are placed helter skelter. Our hookups were near the back with the sewer behind the pad. I had to use an extension on my sewer hose to reach the drain. All the utilities worked and the sewer was threaded for a tight fit (first one in the last 6-7 campsites we have stayed at that had it). There was a table and fire ring on site as well. A few sites even have a hibachi style grill. Garbage and recycles are at the exit. There is a dump station across from the office. Inside the office is a washer and dryer and they cost $2 each. No OTA TV. There is Wi-Fi, but arrangements have to be made to get it and I didn't bother, so can't comment on its operation. Satellite TV is possible in many of the sites. There was are 3 sports field nearby and the weekend partyers, so a bit of noise from both. Also a few baseballs end up in the campground as well. The DW was impressed with this place and asked me to keep this place in mind for any future trips in this area. 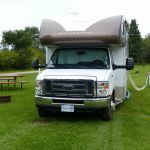 We camped at Big River Regional Park, Community Center Campground in a Motorhome. Are you affiliated with Big River Regional Park, Community Center Campground ?